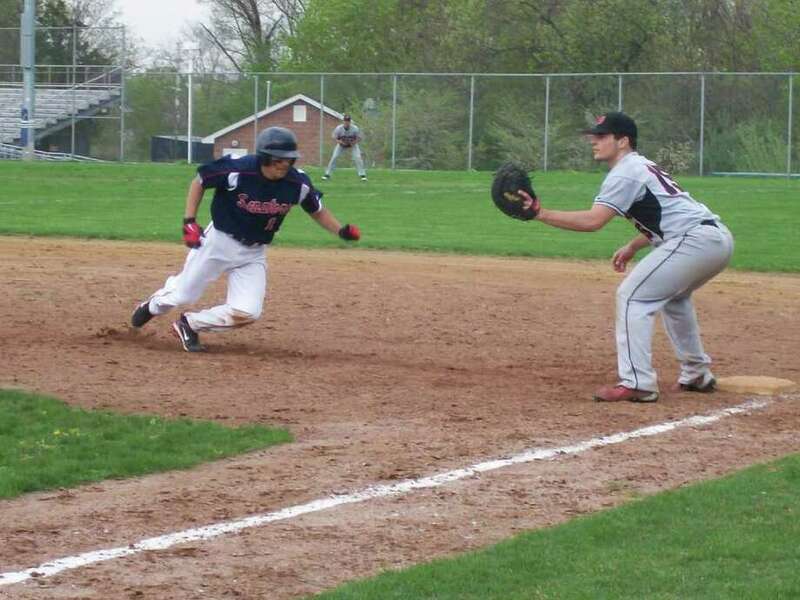 Brien McMahon second baseman Jamie Restivo prepares to slide in safely back to first as a pickoff throw is sent his way in the Senators' 6-5 win over Fairfield Warde Friday. If you believe what you hear, the Fairfield Ludlowe baseball team is young. The Falcons are young in that they don't have the experienced players they did a year ago. There are no Tom Nagys, no Rob Ferraras, no Billy Malones this year. The Falcons only have three position players who were starters in 2010. It could be argued that, because of this youth, the Falcons this year are seeing some sights they're not used to seeing. Ludlowe has lost four of five, with only a narrow, 8-7 win over winless Harding preventing a five-game skid. The Falcons are 5-8 and in fourth place in the FCIAC Central Division and currently are four games out of the final FCIAC playoff berth. Ludlowe has not missed the state playoffs in baseball since the school opened, and has not missed the FCIAC playoffs since 2005. But the Falcons are in extreme danger of doing both this year. The FCIACs are extremely unlikely, barring a late-season surge. And the Falcons have to win three of their final seven games to qualify for states. Before you consider that likely, realize that three of Ludlowe's five wins are over the Bridgeport schools. What is more alarming for Ludlowe faithful is the Falcons' style of play. The Falcons' shortcomings are not limited necessarily to defensive errors, but those have been prevalent as well. "I know we're young," Ludlowe coach Keith O'Rourke said after his team's 8-2 loss to Norwalk last Friday. "I will have patience." The Falcons haven't been able to string hits together. Against Norwalk they had the leadoff man on three times, and only scored once. They give other teams outs with misplays and just look listless on the field at times. "We don't get our hits in the clutch," O'Rourke said. "We get a lot of our hits when the pressure is not on." These are the reasons why none of Ludlowe's losses have even been close. In the Falcons' eight losses, they've been outscored 94-35, an average of 7.4 runs per game. "Every game we've lost, we've given the other team opportunities," O'Rourke said. "I'm not even saying that some of these games we should have won, we should have been more competitive in them. That's where the frustration comes from." There are wins out there, and the Falcons are capable of pulling off an upset or two before the year is over. But with this Jekyll and Hyde team, who knows what you'll get. Maybe a growing year is what Ludlowe needed, and maybe next year the Falcons won't be too young to compete.